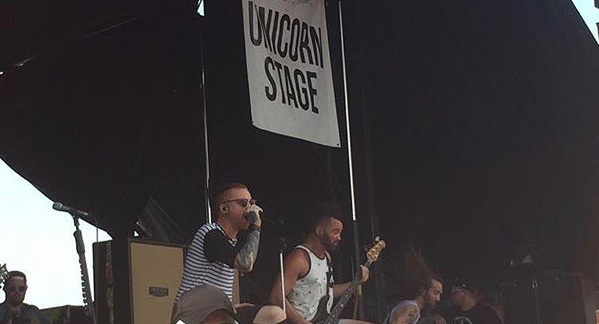 Memphis May Fire on the 2015 Vans Warped Tour presented by Journeys on July 27 at the Hollywood Casino Amphitheater in Maryland Heights, MO. This year's Warped Tour will be the last of the long-running cross-country music festival. Summer is still in full swing and so are the concerts. Looking for something to do? Check out the list below to see who’s stopping by this week as some big names are rolling through St. Louis. Warped Tour is a summer music festival that hosts over 50 bands. Bands such as All Time Low, Fall Out Boy, Blink-182, Good Charlotte and so many more were on the tour. This summer’s Warped Tour will be the last, and with bands who’ve played the show over the years making surprise appearances, it’s a show that’s worth the money and the midwest heat. Tickets are $45 or $30 apiece if purchased in bundles of four and can be purchased online through Live Nation, at the Hollywood Casino Amphitheatre box office or at the doors on the day of the event. Box office hours can be found on the event page. Tour dates, a complete list of bands playing, information about what is allowed into the festival and more can be found on the Vans Warped Tour website by clicking here. The band is described as “jaw-dropping” and are a “must-see,” according to Delmar Hall’s website. Who’s Bad has sold out every House of Blues, the O2 Arena in London, the Gibson Amphitheater in Los Angeles and many more. Tickets are $20 and can be purchased online through Ticketmaster or through Suite 100 at The Pageant. All tickets purchased in person with cash at Suite 100 will be discounted to face value. Hours for Suite 100 can be found on The Pageant’s website. There is a $2 minor surcharge. Combining rock, jazz and classical music, King Crimson is a seven-man band that got its start in 1967 and is still playing music today. THRAK is the name of one tribute band that is playing in St. Louis this Friday. Tickets are $10 and can be purchased online through Ticketmaster or in person at the venue. All tickets purchased in person with cash will be discounted to face value. There is a $2 minor surcharge. Lindsey Stirling has claimed success with her violin. She currently has over 1.5 billion views on her YouTube and has had multiple songs on the Billboard music charts. Stirling’s 2016 album “The Only Pirate at the Party” premiered at number 5 on the Billboard Top 200 Albums chart. Tickets for general admission lawn are $25 or $18.75 if purchased in bundles of four and tickets for reserved seating also begin at $25 and can be purchased online through Live Nation or through the Hollywood Casino Amphitheatre box office. Box office hours can be found on the event page. VIP packages are available for this event and begin at $168. For more information or to purchase, click here. New Hampshire-native Ray LaMontagne creates folk songs that are “alternately lush” and “intimately earthy” according to his Spotify page. His song “Please” gained popularity after it was covered by the season 8 winner of NBC’s The Voice, Sawyer Fredericks. Fredericks’s version of “Please” reached number two on the iTunes singles chart. Neko Case‘s vocals are described as “smoky” and “sophisticated,” while she is described as a “fierce” and “independent” woman who left her home at the age of 15. Case put out an album earlier this year called “Hell-On” which features 12 songs. Tickets begin at $26.50 and can be purchased online through Ticketmaster or in person at the Peabody Opera House box office. Box office hours can be found on the event page. VIP packages are available for this event and begin at $199. For more information or to purchase, click here. The band Styx is most widely associated with the song “Come Sail Away,” which has over 29 million hits on Spotify. In 2017, the band released a concept album called “The Mission,” which was their first “collection of original material” since 2003. Joan Jett’s song “I Hate Myself For Loving You” has over 20 million hits on Spotify. According to her biography, she became a “figurehead” for generations of female rock stars to come. She spent a few summers on Warped Tour opening for bands such as Alice Cooper, Aerosmith and Green Day. Tickets for general admission lawn seating are $20 and tickets for reserved seating begin at $25 or $14.75 if purchased in bundles of four and can be purchased online through Live Nation or through the Hollywood Casino Amphitheatre box office. Box office hours can be found on the event page. VIP packages are available for this event and begin at $225. For more information or to purchase, click here.